When you hear about security breaches, you think about disruption of services to customers, stolen data and identities, and damage to company reputation. But there is another kind of damage that is directly impacting your network management teams, attacks on the computing infrastructure. The ability of network management teams to do their jobs, the time and resources they have available, and their ability to scale the network in order to support the business as it grows are all impacted by security threats. 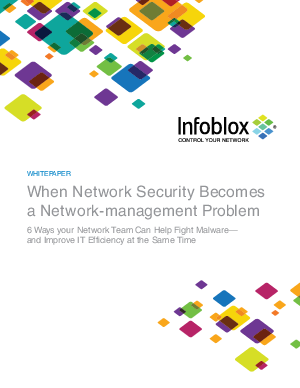 Security isn’t just a security issue; it’s a network management issue as well. This white paper explains six ways in which your network management team can make strong contributions to your company’s defense against botnets, distributed denial of service (DDoS) attacks, designer malware, and all the other scary things that go bump in the Ethernet.